Found the perfect trade route? Made a guide to the galaxy? Post it here! Hello everyone, having struggled and clambered through Ram Tah's mission I thought it'd be good to post a guide to help others out. To enable the obelisk to work you need to be carrying specific ancient artefacts in your SRV cargo. More on these later. 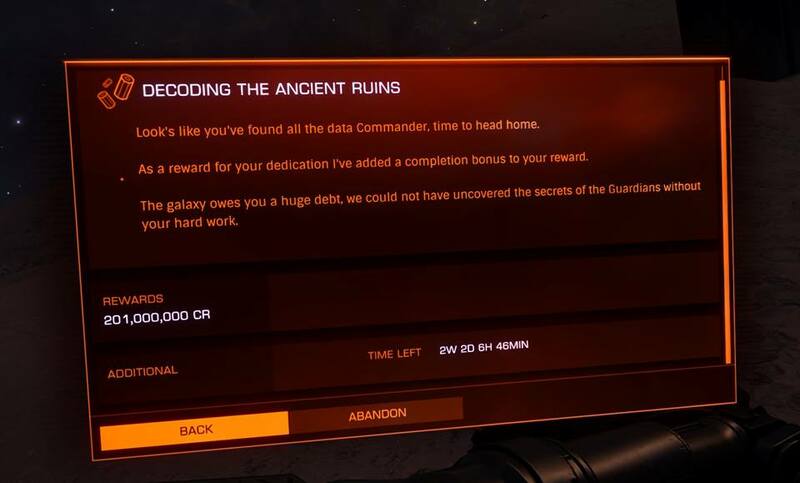 With the correct cargo, you do a scan (secondary fire) on the obelisk and you should get a message from Ram Tah containing the transcript details. These messages are often delayed which is irritating, but can be forced by scanning a second obelisk with any cargo. Keep these messages safe because if you get confused or mess your sheet up, you can use them to check off what you have already done. There are three general layouts for the sites - Alpha, Beta and Gamma - with minor variations across the three types (e.g. Alpha 1, Alpha 1+, Alpha 2, Alpha 3). The minor variations are just about different obelisks working or not, no layout difference. This mission pays CR1m for each transcript you obtain, and a bonus CR100m when you collect the 101st and final transcript. That's CR201m. This counts towards your trade ranking for those interested. Now, head to Meene and collect the mission. Use the map below to find the items. Once collected, fire up "THE SHEET". You might want a printout of it, or you could make an excel version. The sheet is divided in to two sections. The left side details all 101 transcripts and their required cargo and where to find them - e.g. for Technology 5, you need Orb plus Tablet, and you will find it at an Alpha4+ site. How did I know it's Alpha? you will notice the author split these into three groups The top group is all Alpha, the middle is all Beta and the bottom is all Gamma. You'll also notice some boxes are bold outlined, these are the combinations that at the time of writing are only solvable in Open (possibly private group too). The right side serves as an itinerary plan. You can see that the first stop is in Solo at SYNUEFE TP-F B44-0, there are three locations listed all at planet CD1- Gamma1+, Alpha1+ and Beta3+, with 21, 15 and 6 readable obelisks respectively. Looking back at the left hand side, you can see there are 21 obelisks in the Gamma section at the bottom that have a "1" or a "1+" beside them, 15 in the Alpha section and 6 in the Beta section. This is how we know what to go hunting at the various locations. 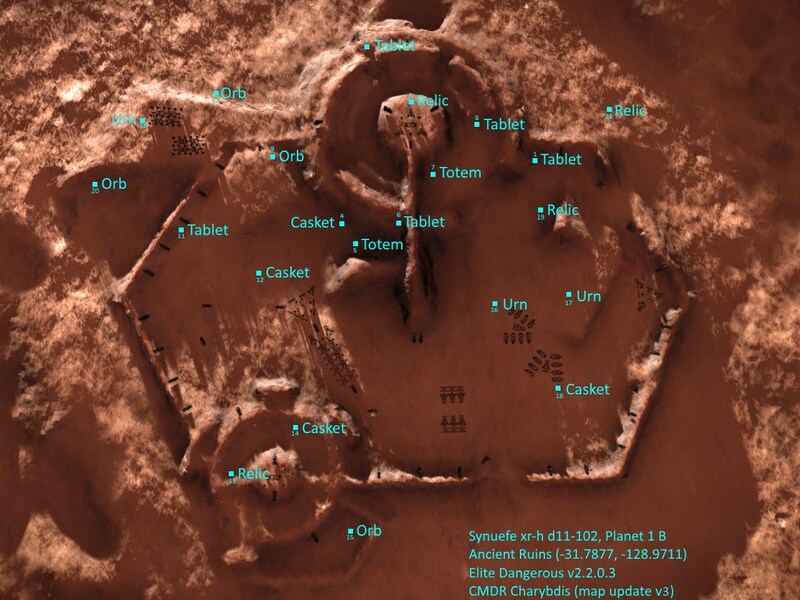 Firing up the Map link, and read down the list until you get to SYNUEFE TP-F B44-0 (γ1+) which was the ninth site to be discovered. Click the link and you should get a map like the one below. This is an interactive map of the gamma1+ site. 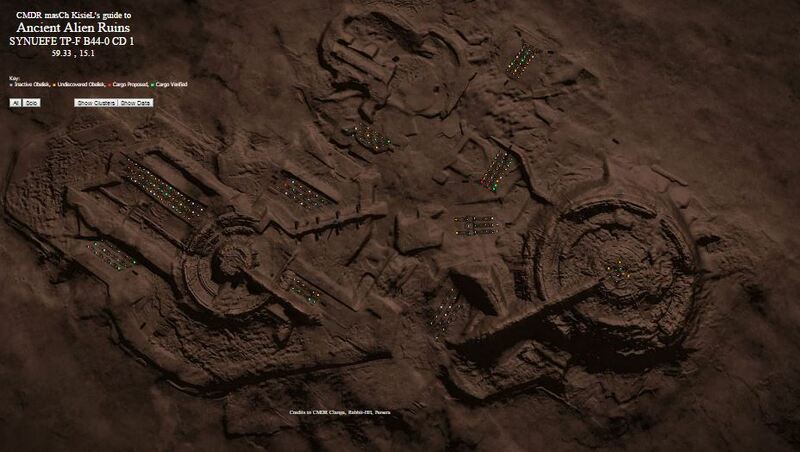 You can find the exact locations of all 21 obelisks here, and using THE SHEET you can tell what cargo to use to obtain the transcript. Now head to SYNUEFE TP-F B44-0 and start collecting. You'll notice at the very bottom of THE SHEET there is an object to collect in PG/Open (Bio19) that is at SYNUEFE TP-F B44-0 γ1+. My advice is drop in to open while you're there and collect it. Typically in open, you need four commanders present to make the obelisk work. I found that once we were four (sometimes took a while) I relogged until the obelisk lit up. Other commanders also relog so it doesn't usually take long (I never waited longer than about 15mins). Also please be aware of "The Bleed". This is a bug. If two commanders are present - CMDR A and CMDR B - then if both commanders have the required cargo for a given obelisk in their cargo hold (ship or SRV - wherever they are present at the time of the scan) , then if CMDR A successfully scans the obelisk, CMDR B will also get the transcript. Sounds complicated but basically get in your ship with all the artefacts and sit in public while others scan and you'll also get the transcripts. Once you've got all 42 solo objects and the 1 open object from SYNUEFE TP-F B44-0, set course for COL 173 SECTOR KY-Q D5-47 and do the same! Feel free to add me - CMDR Evoflash. I won't be doing this task again in the foreseeable future, but I'm always happy to say hi! I recommend getting a few of you to do it. Last edited by Evoflash on Mon Feb 27, 2017 4:06 pm, edited 2 times in total. Amazing guide. Thy. 200+M reward... Woooww!!! I found this guide to be an amazing help to start out. I am just 13 scans in, on the d-11 102 site. Question: while the (amazing maps) from nusantara.com have helped a bunch for the SOLO scans, I have come up empty on all of the others. I have been putting the correct items in my cargo, and scanning them with no result. Is the data incorrect, or is it a bug? Question 2: Glad to have the maps, but would love to understand the column of "where to find them." I see the 1,2,3 et cetera, and the articles' author used the example of Technology 5 being found in Alpah 4+. Not sure how to correlate that. There are 7 zones, after all, not three. He breaks down Alpha, Beta, and Gamma, but those are a bit confusing to me. Any help? And... thank you so much. This has been a big help. TTL Kaja wrote: I found this guide to be an amazing help to start out. I am just 13 scans in, on the d-11 102 site. The blocks on the left correspond to the major type of site (alpha, beta, gamma). Going by the history column, 1-7 are alpha, 8-16 are beta, and 17-21 are gamma. The number to the right of the checkbox indicates the type of sub-type of site it can be found at. eg. History 17 has 1+ listed, which means it can be found only in sites with the 1+ designation (Gamma1+ since its in the gamma section). For my question, I've finished all of the Gamma1+ site except for Bio 19 which can supposedly only be found in open. I've tried and relogged at least six times so far without getting it to show up, am I missing something as to how to activate the open only obelisks? Answer #1: The data is correct. OPEN mode is not enough; there needs to be 2-4 ships/people present in OPEN [4 is most likely], to activate the obelisks. millions of credits. Use the other link for planet/site locations and site maps. The final two systems listed [again, COL 173 SECTOR KY-Q D5-47 and SYNUEFE TP-F B44-0], 3 sites, and 9 data sets, must be accessed in OPEN with up to 4 players present. 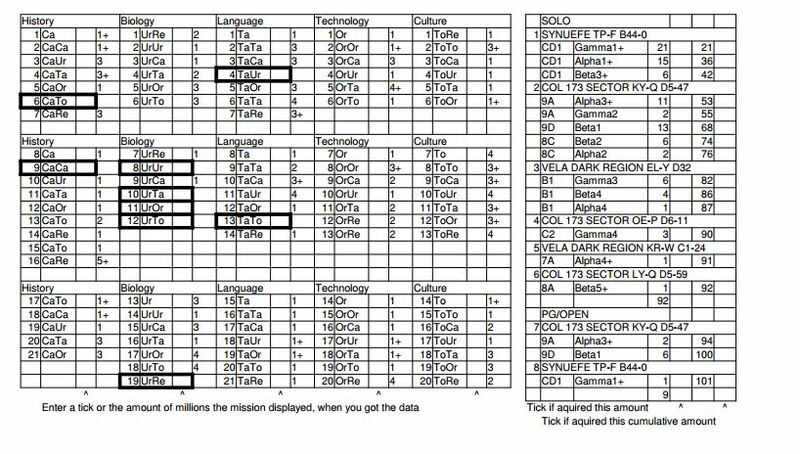 Solo locations for these data sets have not been found yet, and the only way to complete the mission is to use the OPEN exploit. OPEN is not enough. The last 9 data sets [COL 173 SECTOR KY-Q D5-47 and SYNUEFE TP-F B44-0], Bio-08,10,11,12,19, Hist-06,09, and Lang-04,13, currently can not be obtained in SOLO, but only in OPEN when up to 4 players/ships are present. I'm currently stuck at this point; I sat and waited for a couple hours, but no one showed in that time. So PM me when you get to 92 data sets. I'm currently stuck on the last nine OPEN data sets Bio-8,10,11,12,19, Hist-06,09, Lang-04,13, so anyone in the same boat PM me, we can schedule visits to COL 173 SECTOR KY-Q D5-47 and SYNUEFE TP-F B44-0. I'm in a similar boat now. I usually can get online after about 7 pm PST.